This customer requested a Feather Wreath in the plain blocks between the Dresden Plates. I had to mark a few reference points with a Purple Air Fading marker, but it is all stitch Freehand. Might have been easier on the body with a computer, instead 20 full size and 20 half size 8" wreaths and 30 Dresden Plates. There was also a 3 wreath table runner and a one wreath runner. All down ready to go home now. Your feather wreaths are beautiful. Hope you demo that for me when you come in August. Lovely finish! Love the Dresdens, they are such a timeless patchwork quilt. the quilting has really made the quilt look great. This is so gorgeous! 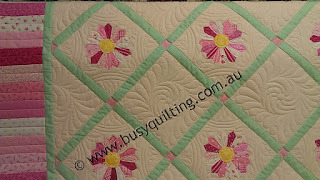 I really love the secondary pattern that emerges in the quilting scheme. 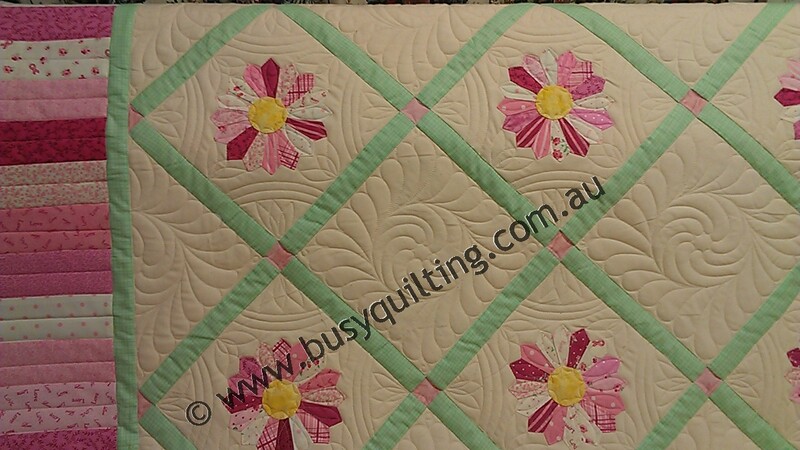 Very, very pretty and so complementary for this quilt!